Green leafy vegetables are always my favorite and among all of the leafy vegetables my favorite one is Pui Saag or Pohi Saag. And Pui Saag is just the perfect saag which you can cook with fish also. 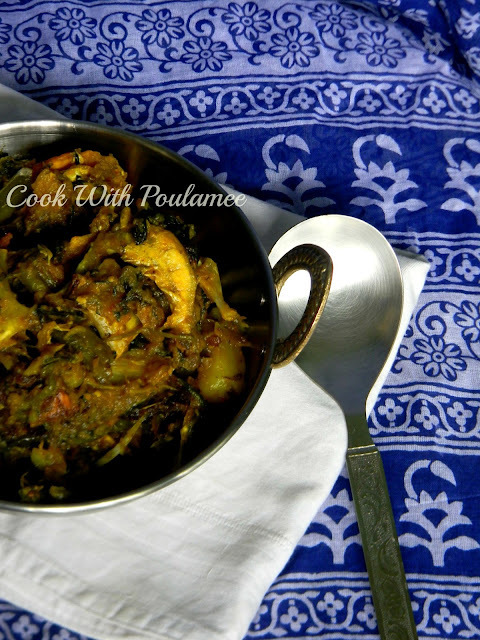 One of the oldest and authentic Bengali preparations is MACHER MATHA DIYE PUI SAAG or CHACHRA OR POHI SAAG COOKED WITH FISH HEAD. 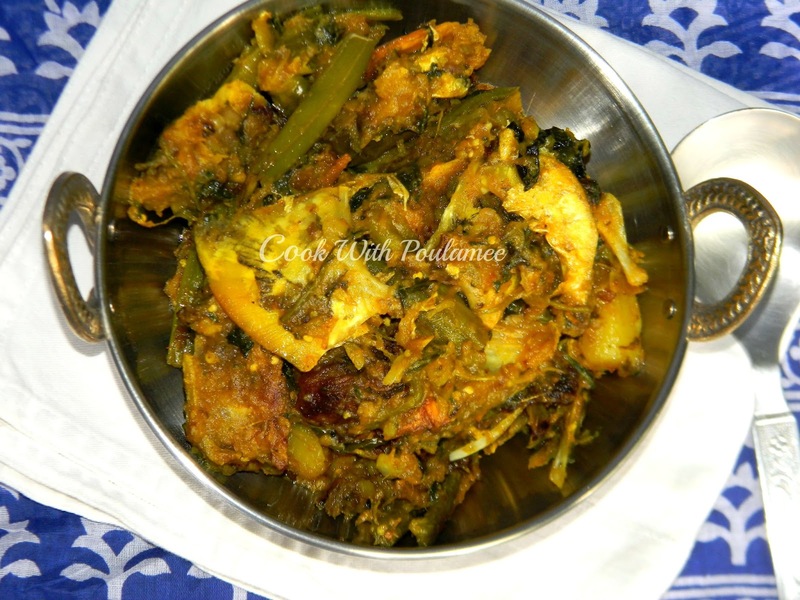 Few important vegetables also you need to cook this dish. And I think there are only few Bengalis who don't have this dish ever. And dish one also my Ma’s recipe. Here we really feel zealous when we see somebody having this dish but nothing to do, so before going for vacation I told my ma please arrange everything one day I want to make this in front of you. And believe me my first try turned out perfectly. Thank u maa for your help. Cooking time: 30 to 40 mints. 1.Pui Saag: One bunch. (chopped the leaf and cut the data or danthal into finger size). 2.Ruhu or Katla Fish Head: One big size. 3.Pumpkin: One small bowl. (cut into cube size). 4.Parwal or Patol: four to five (Cut into cube size). 5.One large potato: Cut into cube zise. 6.Four to five split green chilies. 8.Half tea spoon turmeric powder. 9.One large onion paste,One tea spoon ginger & garlic paste. 10.Salt and sugar as per taste. Wash and clean the fish head and make some small pieces now marinate them with pinch of turmeric powder and salt. Now add some mustard oil a vessel and fry the fish heads till it become brownish and keep it aside. Now add some more oil in the same vessel, now slowly add the pumpkins, Patol’s, potatoes and the saag danthals with a pinch of turmeric powder one after one (fry separately). Fry for some time and keep it aside. Now add some more oil and add the paanch foron and slowly add the split green chilies and the onion+ginger+garlic paste and now add the turmeric powder and some salt and sugar and cook this in low flame till the oil separate from the masala. Now add the fried fish heads into the masala and cook for some time. 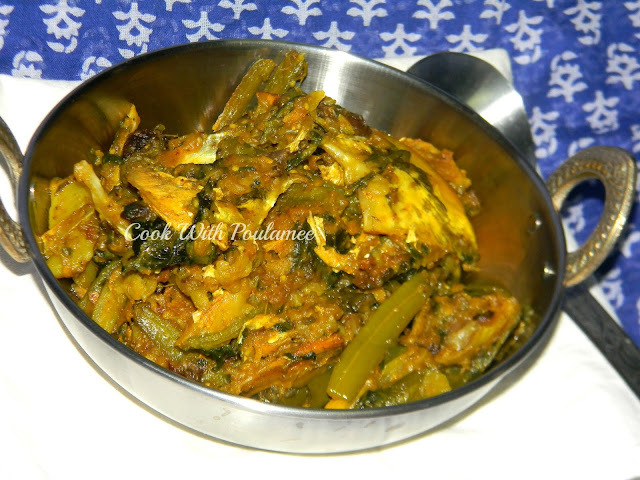 Slowly add the fried vegetablesand the saag danthals and cook in low flame with a lid. Now remove the lead and add the chopped saag leafs and mixed nicely. And cook this in low flame with a lid for 10 to 12 mints till the oil separate from the curry. 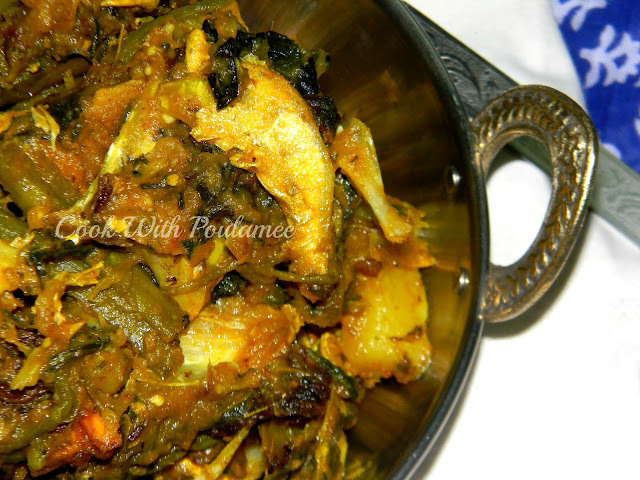 Your CHACHRA IS READY OR YOU CAN CALL VEGETABLE MISHMASH WITH FISH HEAD OR MACHER MATHA DIYE PUI SAAG. So for one dish you have so many names serve hot with plain rice. Chicken Dak Bungalow: A Sunday Special. Kolkata Style Phulkapir Singara or Bengali Samosa.